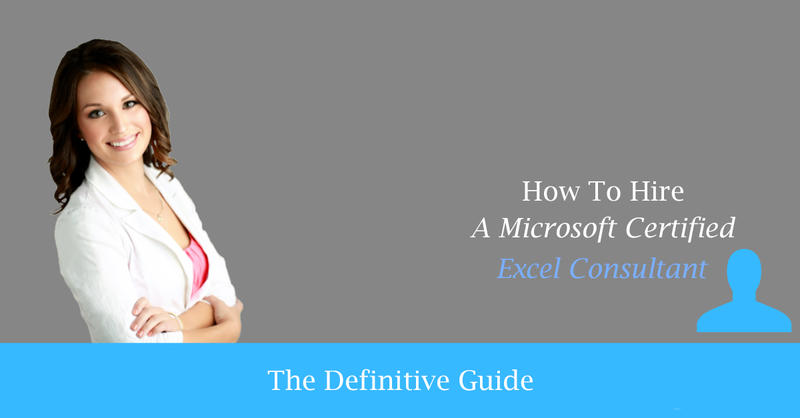 The Definitive Guide to Successfully hiring a Microsoft Excel consultancy. Give this the once over, then you can decide if you should hire us, or them, an individual or a corporation, 2-3 years experience or 22 years in business? So many things to take note of. Okay, so you have decided that you need to hire a Microsoft Excel consultant or an Excel programmer to either work on Excel files you already have, or to build a new Excel based application, from scratch. Sounds easy enough, but wait, how do you successfully hire a Microsoft Excel consultant or programmer? We wrote this page to help you make sense of the market and to help you to navigate the waters. We used our 23 years of experience as one of the superior Excel consulting firms to come up with the list below. Follow this and you have a very good chance of getting what you were looking for. And if you have questions about the market we will be happy to discuss them with you. Mission Critical, get this wrong and it may cost you dearly, so take the time to fully understand your needs and take as much time as needed to fully think it through. And it is okay to have the Excel consultant to do a paid deep dive analysis to help you with this effort. Think in terms of what you “need” in the Excel application versus what you “want” in the application. Before you speak with anyone take the time to sit down with your staff and discuss your needs. Make sure to include the users of the system. Know what would be nice and what is required, and what can wait for phase two. So you know what you need in the Excel application. But you also need to know what you want from the firm that you hire. Here are just a few of those possible requirements. Hire a company over an individual. Do you need a local company or will remote work. Number of years of consulting and programming experience. Does the company work strictly in Excel, or Access as well. What are their days of operation. What are their hours of operation. Do they have a corporate office you can visit. Google is the best search method/tool you can use to find the right Microsoft Excel consultant to hire. Look at those companies ranked 1st, 2nd and 3rd, as Google values those companies over the others. Either type in the search phrase “Excel Consultant” or “Local Excel Consultant” depending on your needs. Which companies comes up first, second, or third? Those are the ones that matter most to Google. In Google’s eyes it matters who comes up first, second, and third, that is what counts. Not the paid ads, but the organic results are what you want to see. Not individual freelancers, not those foreign based freelancer websites, but corporations with 20 or more years in the business, if possible, the market leader. Are They A 5-Star Rated Company? Online Client Reviews can tell you a lot about a company. When you read them do you see different clients saying the same things? Are they confirming the qualities of the company? Always look for a 5-Star Rated company. Those are the companies that you want to work with. It is your money so hire the best firm for the dollar. Our company was in need of VBA programming for an Excel template I had created. Excel & Access response time with a quote and a finished product was superior; they made the process simple and easy and by far exceeded our expectations with their responsiveness and accuracy of the output. Excel & Access truly takes pride in their work and business relationships. I highly recommend Excel & Access to any company looking for professional, accurate and VERY expeditious service!!. There are numerous freelancer websites in the results these days. These are typically offering low cost individuals that work out of India. They are not companies and they are not professional consultants, they are individuals that often miss the mark, based on what our clients have told us. $12 an hour sounds great, that is until you see the results. You often get what you pay for, and you often have to hire two or three companies if you go the low cost route. For the firms that are ranked in the top three spots in the organic rankings section on Google. take a few moments and look at their websites. Do they look professional. Do they have case studies? Do they have the credentials? If you like what you see then take a deeper look at the company. If you do not like what you see, then move on. Surprisingly the majority of people in this space work out of their home and do not have an office. Look for those firms that do have an office (See our office), one you can visit. The longer they have done so tells you that the company is legit. Their team page will tell you a lot about them. Do they have a team page? Is so, how many people are on it? For the people on it, what do they do and how long have they been doing it? Are they the top experts in the field? Has Microsoft certified them? Do they have a page on the Microsoft website? If not, you may question if they are a legitimate company or are they a single person doing freelance work out of their home in the evenings and over the weekend. You want to hire a fully staffed company, not a freelancer. Do you recognize the names of their clients? If so, are there just a few known names or are there dozens and dozens? This is very telling. Read the testimonials on their website and on LinkedIn.com. How many do they have, what do they say, who wrote them. For example, if Red Bull was a client, did Red Bull write a testimonial? Is there a case study on the Red Bull project? All of this tells you much. What if you live and work in the UK versus the USA, does it , matter when you conduct your Google search? Yes it does if you are looking for a local Excel consultant or programmer versus working with one on a remote basis. Not saying remote is bad, as it is not, it is the norm in the niche, but still better to look for those companies in both markets. You will quickly find just a few that meet that criteria. Do they have social media accounts? If so, what do they have to say? Are they certified by Microsoft? Being so is huge. Ignore things such as the Better Business Bureau, Norton, etc. You want to see certifications from Microsoft. Even better, you want to hire a firm that Microsoft has hired. And if Microsoft hired them more than once, that is even better. Think about it, if Microsoft Certifies them and if Microsoft hires them repeatedly, that tells you that the firm delivers. Are any of their experts certified by Experts-Exchange.Com? If so, how high are they ranked? Being so means they are an expert in the application(s), such as Helen Feddema being ranked as #2 in Access development. Do their trainers have training videos on Lynda.Com? If so how many. Dennis Taylor has over 55 and he is one of their topped ranked experts, and he is our senior Excel trainer. Do they own and operate one of the top Microsoft help forums? We do, look at VBAExpress.com. When we say we wrote the book on it, we mane it, literally. Several of our programmers and trainers have written books on the applications they work in. Often our competitors read those books to learn Excel, Access, Word or Outlook. Now you have the names of the top companies, it is time to reach out to contact them to see if they are the Excel consultant that you want to hire. If you called the company, did they answer the phone or did it go to voicemail? If it went to voicemail how much time did they take to respond to you? If you used the contact form to submit your needs, or if you emailed them, did they responded to within minutes, hours or days. How responsive are they are can tell you a lot about the company, and if they should be considered. Does the company offer free consultations to gain an understanding of your needs and their ability to assist you? Why should you pay for this? If the company wants to work with you, this should be offered. If your needs are extensive, then we recommend that the company should offer a paid deep-dive to fully spec out the work. These can be offered either onsite (At our office or yours), or remotely, which is the norm. An on site discovery meeting is very similar to an off site consultation. But onsite involves visiting your office in-person to gain a better understanding of your current capabilities and workflow so that we can help you enhance your performance. This is very important, make sure to get what work will be done in writing. Usually called a statement of work (SOW) or project scope. Make sure it includes what you want to have done, and make sure to ask any and all the questions you have. This helps to prevent misunderstandings. Get in writing what the project will cost, both in terms of time and money. Is it fixed-bid or by the hour? What is their pricing policy? There are four costs to any project. Two you are already aware of, and two you may not be. Here they are. Time, how long does it take to have the application in production. How many dollars will you pay for the work. The cost of the application not doing everything you want it to. The cost of repeating the project. Those 4 items make up the cost of your project. You will want to know what they are. Okay, so you have taken the time to determine which company to hire, what hiring them will cost, and how long it will take to have the work done. Now your decision has been made and it is time to move forward. Not only is it important to know what the project will cost you it is also important that you have a signed project agreement. This will include details on the project, the statement of work and the costs of the work. In addition to how you may pay, how much will you be asked to pay upfront (Retainer), weekly, on delivery, etc. Make sure to have these details in your project agreement. So is there a satisfaction guarantee? What about a guarantee against bugs. If so, what do they cover, and are there limitations. Typically the company will deliver the application when it is complete, but that does not mean the work is done. Usually the company will ask you to test the work, and let them know if changes/tweaks are needed. There may be several rounds of this before the project id done. Make sure the company will be there when you need support, be it making changes/additions to your work, or fixing bugs. How long have they been around, and how long will they be around so that they will be there should you need them. Would you work with them again? Hiring them once, and getting the application you were looking for is one thing, wanting to work with them again is a whole different thing. I often say a company may hire you once, maybe twice, but it is the number of companies that hire you the third time that tells the tell. Microsoft, Red Bull and Staples for example are companies that have worked with us three times or more. Why, because we make sure to deliver. Make sure the company you want to hire has delivered to big name clients again and again. When you look at their testimonials, do they say they would hire the company again, and do they recommend the company? ** Why Should You Hire Us? Why should you hire us for our superior Excel consulting services? Because we have been delivering the goods successfully since 1994, that is 22 years and counting. Even more amazing we have been a Microsoft Certified Partner the entire time, out of our Irvine California office, right in the center of Orange County. The Definitive Guide To Hiring an Excel Consultant.